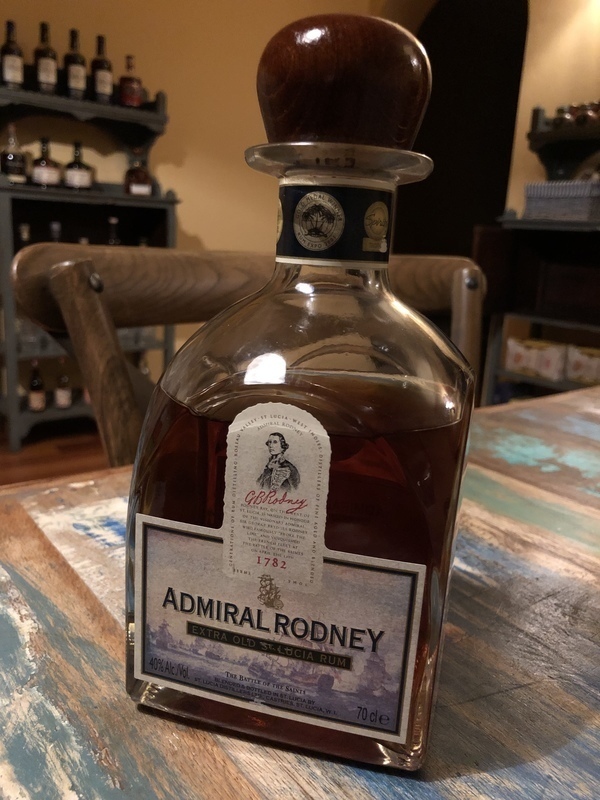 Have you found an online vendor selling Admiral Rodney Extra Old 12-Year? Admiral Rodney Extra Old rum is produced in St. Lucia using a continuous still, and then aged in American oak casks for an average of 12 years. The rum is named after British Naval Officer Admiral George Rodney, who in 1782 as the Governor of St. Lucia rebuffed the Spanish fleet in the "Battle of the Saints". On the nose: Very sweet! Very strong aromas of maple syrup and vanilla. I don't think I've ever smelled a rum with quite so much maple syrup character. In the mouth: Taste to match: very sweet. And not overly smooth. I'd compare this rum to Papa's Pilar Dark (which I'm also no fan of) and Zacapa 23, though I find even Zacapa to be more interesting than the Admiral. If sweet's your thing, go for it. But for me, it's a bit of a let-down. Comes in one of the most beautiful bottles in the world of rum. Absolute stunning shape, and gorgeous wooden cork top. Can’t get enough of looking at the amber color through this bottle. Lifting the cork reveals smooth vanilla, toffee and dark chocolate. In the glass - Lovely color and and beautiful legs. Nose - Powerful… Molasses, toffee, dark chocolate. Taste - Charred oak, vanilla, toffee, leather, dark chocolate finish. Absolutely gorgeous rum. Easy on the eyes, powerful in the mouth. Just a nice complete package. I would recommend adding, just a little water, witch removes the initial harshness of the spirit. This brings out the clean flavors of the aged rum even more. One of my first aged rums. One of my fist re-buys, and one that I, with out a doubt, will buy again. Sugar: Estimated at 5 GPL. A well balanced rum except for the strong alcohol smell and taste. Great colour and bottle. Well balanced and smooth tastes of vanilla, oak, maple syrup, and burnt caramel or raisins, and there is that smokey biting taste from the bourbon casks it's aged in. To a certain degree this smells and tastes a bit like an over proof or strong Navy style rum. At $109 per bottle in Ontario it's over priced. I like it, but it needs some moderation with ice or a drop of water to be a sipping rum, unless you like the strong burn it has. This is a really good rum. Probably the best I've had so far. I really like it. Lots of taste and not too sweet. Fles: 70cl, grappige ½ bol op ½ kubus vorm, met grote houten dop/kurk. Komt in een sjieke doos. Deze rum heeft 12 jaar in Bourbon vaten gerijpt. Het resultaat is een zachte rum die smaakt als een echte rum wat mij betreft. Veel Karamel, ietwat zoete vanille, eik en een kruidige droge nasmaak. Al met al een prima rum naar ietwat eentonig. fijne, lang in eikenhouten vaten gerijpte St. Lucia Rums. Admiral Rodney Extra Old is een mooie rum en uitermate geschikt om puur van te genieten. I always pick up a few bottles of this rum when I in St. Lucia. I find this rum best when served on the rocks or straight up. Never a disappointment. Smooth, mellow and the bottle disappears quickly. Aged in bourbon barrels, this soft, medium bodied spirit shows caramel, sweet dried fruit and brown spices, with a very smooth medium-dry finish. A fine example of a navy style rum from St. Lucia. This rum exceeded my expectations based on its current score. Smells and tastes of brown sugar, molasses, pepper, caramel, bourbon, oak, and leather. Somewhat sweet, but not too much. Only $49.99 (2016) @ drinkupny.com. Swirled the glassed and left amazed staring at the oily ring and legs. A fresh alcohol kick in the first place woke my smelling and tasting senses. Left it to rest for a while and soon its' true complex character was revealed. Smooth and perfectly balanced, with dominating fine mild sweetness, light oak aromas and rich aftertaste, simply leaves you with a feeling of asking for more! A place both in my heart and on the top shelve among the rest great labels rated over 8 is well deserved for this premium rum. A very nice rum to enjoy neat or with an ice cube to bring out more flavor. Admiral Rodney X/O 12 is a smooth rum with limited heat. A true rum for rum lovers with a complex portfolio from start to finish. Nice mahogany color illustrated from the amount of time aged in bourbon casks. Love the wonderful bottle presentation that stands out to let you know that you are in for a treat! A rum drinkers rum. Skeptical at first but learnt to love it. Strong on the nose and on the palate, definitely a staple in any collection. A salute to the Admiral. Great rum that you can drink on the rocks or straight. I went to the distillers and those guys know what they are doing. I love the blend of oak, spice and fruit and the gentle burn from the alcohol. The one thing I would like this to have, is a fuller finish. While it is moderately long, it lacks a real punch. But a beautiful rum none the less. Disclaimer: I love the Chairman's Reserve from St Lucia Distillers. So I was anxious to try their next-in-line offering. I found many of the same characteristics here - a wonderful color in the glass, a great variety of flavors in the mouth (though tending toward caramel/burnt-sugar), and a smooth cool finish. This rum is a pleasure to sip. However, the additional aging seems to remove the one thing that makes the Chairman's Reserve unique - it's foxy, grassy, au-naturale aroma. Call me a heathen, but given the price difference, I can't rate this higher than the Chairman. I love this elegantly balanced rum, that fits almost every occasion. 100% collum still with 0% added sugar. Rather complex despite no pot still has been used, in contrast to most other st. lucian rum. The nose is remarkably sweet, considering the absence of sugar, with notes of oak, leather, brown sugar and vanilla. The taste will make any real rum lover happy, especially considering the price. In many ways it's comparable to rum like Flor de cana 25 or Appelton 21, and at a significantly lower price. On the slightly sweet palate refined notes of leather, sweet tobaco, brown sugar and prunes treats you good, before fading into lovely tingling oaky tones. A bloody keeper. Un rhum avec une très belle couleur caramel, un nez avec une note sucrée et épicée. En bouche, c'est assez facile et assez peu complexe, avec une note de fruit confit (raisin, pruneau ?). La longueur en bouche est assez décevante. Pas de grande personnalité pour ce rhum qui est quand même assez consensuel car facile à boire et assez peu marqué sur l'alcool. A rum with a beautiful caramel color, a nose with a sweet and spicy notes. In the mouth, it is quite easy and not very complex, with a note of dry fruits (grape, prune ?). The length in the mouth is quite disappointing and very short. No great personality for this rum that is still quite consensual because easy to drink and not very marked on alcohol. The aroma level is quite low, soft all around taste, hints of caramel, hints of spices (pepper?). Taste of black spice (cerne koreni). Interesting sound, full taste. Yeah a truly cruise worthy rum, has a hint of spice and would give a higher rating if it didn’t feel that it were watered down. Not too sweet but missing the caramel notes traditional of an aged rum. Bought this on recommendation of the owner of the shop I purchase a lot of rum from. Nice balance on the sweetness and a smooth rounded finish. Matured in ex Bourbon Casks. A Good Rum, Delicate and Raffinate. "scents of caramel, vanilla and banana up front..."
"a rich amber colour, it is quite thick and viscous..."
"Bright amber, mahogany colour. Incredibly attractive nose..."
"Initial aromas are of deep vanilla, oak, cherry and toffee..."